Couples visiting the Grand Strand will find plenty of romantic ways to steal away for a night alone together. While there are many obvious choices, such as enjoying the sun setting on the beach or shopping, there are also some surprising options like area wineries, fine Southern dining and a vibrant nightlife. Here is our suggestion for the ultimate Myrtle Beach date night. A great start to your Myrtle Beach date night is a stop at Myrtle Beach’s Duplin Winery located at Barefoot Landing. The 15,000 square foot facility is a wonderful indoor space not only to sample, but to browse through bottles of this North Carolina-made muscadine wine. Inside, you can see a demonstration of how wine is bottled and even see a replica of Cape Hatteras’ famous lighthouse. Tastings, which cost $10, take place every 15 minutes and allow you to sample up to 10 different wines and keep a souvenir wine glass. After you’ve found your favorite muscadine wine, burn some calories with a barefoot walk along this beautiful South Carolina beach at sunset hand in hand. Keep an eye out for dolphins frolicking in the surf and search for shells together as the waves wash underfoot. Imagine servers in tuxedos presenting you top-notch Southern cuisine in an elegant setting. The only AAA 3 Diamond and Forbes 3 Star restaurant in the area, The Library restaurant has been serving Myrtle Beach patrons in style since 1974. Try the famous Steak Diane or one of their flambe desserts, all of which are prepared tableside, for a memorable experience. There’s no shortage of entertaining shows in Myrtle Beach with something for all tastes from musicals and comedy to pirates and arena shows like Medieval Times. The Carolina Opry is a two-hour variety show that includes music, comedy and dance in a 2200-seat theater or consider Legends in Concert, a tribute show to popular stars like Elvis, Michael Jackson, Dolly Parton and Madonna. Other choices include the Pirates Voyage Dinner & Show, Thunder & Light starring the clogging group All That!, and the Alabama Theatre, which brings top music acts to the area. If you’re not too tired after your show, stop by Broadway at the Beach to enjoy the popular entertainment district’s vibrant nightlife. Grab a frozen daiquiri, known as the strongest drink on the Strand, at Fat Tuesday direct from New Orleans, dance the night away at Oz, or watch dueling pianists at Crocodile Rocks. Many area Myrtle Beach hotels have rooms with Jacuzzis, some not in the bathroom, but actually in the bedroom! Check out the Jacuzzi suite at Caravelle resort with mood lighting above the tub, as well as the Oceanfront King or Queen Jacuzzi suite at Crown Reef Beach Resort & Waterpark. It’s the perfect way to end your night with a romantic and relaxing soak. Here are even more Jacuzzi suites around the U.S.
Here’s to a wonderfully romantic evening in the Grand Strand! 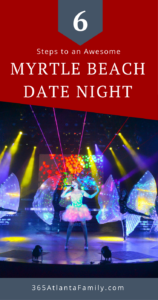 Be the first to comment on "6 Steps to an Awesome Myrtle Beach Date Night"